Hello everyone! I guess I've been lacking on updates here. I've been not too busy, but when I am I'm a little nuts. You know me, I love for all of my time to be consumed so when it's not I get really antsy. I've been back around two weeks and it's been nice. I've been working for Dennis on stuff for the Grammy Museum which has been an awesome experience. It's always fun going to LA Live and even better spending time with a mentor. He took me to NAMM in Ahaheim with Eric Stock, the Production Manager of the museum. It was awesome! Tons of great products, software and instruments for the music world... and a variety of wannabe rockers and industry professionals. We were only there about an hour and there was so much to take in that by the end of it we were pooped. 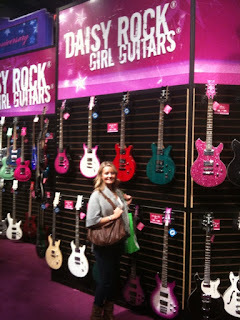 Here's me at an exhibit called Daisy Guitars. They make guitars specifically for women. I am a closet electric guitar lover (I promise you that every song I consider a favorite probably has the electric guitar in it) and plan to learn how to play at some point, so a sparkly pink guitar would definitely get me going. After being back I've been going on a lot of auditions! I had one for LG, TV Guide and a student film last week. I scored the LG promo (yes!) and I haven't heard back from the student film, but regardless all of the auditions were great for experience. Working with LG was interesting because we were shooting for their security solutions brand of products and most of the crew didn't speak English. Luckily there were translators but it made for interesting shots. Everyone was really nice and insightful so I can't complain about anything. I played the principal of the production which was amazing and intimidating all at the same time. Apparently I didn't look as old as they hoped so they transformed me with make-up. I wasn't about to get all diva on my first shoot but I guess the best way to put it is that the good make-up artists probably come around when you've hit the big time. :) Our first scene was in a park and while they said I'd be on set for 12 hours I was only there for three. Then on Monday the shoot started at 11:00 pm at a super market and I didn't leave until 7:00 am! I was in the first and last shot of the night so I was pretty exhausted. On Monday before work I had an interview with a marketing agency who is starting a new venture targeting men. It's for a stylist position where I would basically get paid to take guys out to shop. Score! Since it's in the start-up mode it would be part-time which would work out perfectly with auditions. Not to mention they said there was room for growth and opportunity and the guys I met were really cool. Hopefully that works out. I changed the look of my blog! What do you think? Feedback would be appreciated...! There's a huge event going on on Friday and I could have the opportunity to be a part of it, although right now it's not looking too good. I am praying that if it's in God's will to have me work this event that something will happen! That's about all. It's practically a monsoon here so I've been fighting with my inner demons about going to the gym. Off I go! Love the new layout!!! Awesome! Keep stirringit up out there!! !